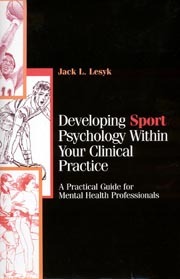 by Jack J. Lesyk, Ph.D.
published by Jossey-Bass, San Francisco, 1998. “Sport psychology was once the domain of a small number of psychologists who worked exclusively with elite Olympic and professional athletes. But today, sport psychologists also use their proven techniques with non-athletes and weekend sport enthusiasts. At a time when many behavioral health care clinicians are facing a loss of income, cut-backs, and decreased funding, many sport psychologists are enjoying practices that are expanding and thriving. “This practical and extremely useful guide is written for mental health professionals who want to apply the techniques of sport psychology to current clients with presenting problems such as depression, anxiety, and stress using techniques such as motivation, mild exercise, and self-talk. In addition, a new population of clients, including both serious and recreational athletes, women, seniors, and kids at all levels of skill and experience can be recruited. The author, a successful clinical and sport psychologist, gives detailed advice on the best way to include sport psychology in an existing practice. He also demonstrates how to apply cognitive-behavioral and social learning techniques within a sport psychology context. Coordinator, Post Graduate Research Studies, Centre for Rehabilitation, Exercise, & Sport Science. Victoria University, Melbourne, Australia. Sports Counselor, Boston, MA, from a review in The AAASP Newsletter, Summer 2000. Available from the publisher and Amazon.com at $45. The publisher is no longer printing the hard cover volume and it is no longer available from that source. However, I have the entire book (minus index) available as a PDF file. This is an exact copy of the final manuscript that I submitted to the publisher. The manuscript that you will receive is 269 pages. Upon receipt of payment, the entire book will be sent to your email address as a PDF file attachment.